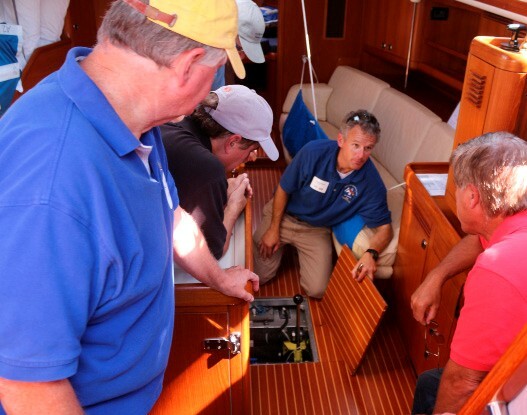 Brewer Pilots Point Marina in Westbrook, CT will host an Offshore Boat Preparation Seminar for racers and cruisers on Saturday, November 7, 2015. This is the third in the series for the Brewer Yacht Yard Group, who has hosted two previous events that were well attended by offshore sailors and crews planning to participate in the 2016 Newport Bermuda Race or make an offshore voyage. The seminar will focus on assisting racers and offshore sailors how to prepare their vessels for a safe and swift voyage. Speakers will include Rives Potts, owner/skipper of the 2010 and 2012 St. David’s Lighthouse Trophy winner Carina, Michael Keyworth, VP and GM of Brewer Cove Haven Marina, and Newport Bermuda Race Chief Inspector James Phyfe. The team of Brewer experts will discuss the elements of the most commonly used offshore safety standards, including the ISAF Offshore Special Regulations (OSR) and US Sailing Special Equipment Requirements (USSER). Using images and demonstrations, presenters will discuss the intent behind each requirement and straightforward methods of compliance that won’t break the bank. Race-ready boats will be available for review and discussion. While particular emphasis will be placed on the requirements for the 2016 Newport Bermuda Race, common provisions of all offshore racing requirements will be discussed and ample time will be allowed for questions and answers. Topics will include: hull construction and stability; rigging and sail selection (including storm sails); safety and emergency equipment; training and Safety at Sea credentials; and navigation and communication devices. Of value to both racers and cruisers alike, this series will give anyone preparing their boat for extended voyaging the peace of mind that comes with hearing from the most experienced advisors in the industry. The cost of $125 per boat entitles all crewmembers to attend. For more information on the seminar and to register, visit www.byy.com/NBR or contact Lynn Oliver at loliver@byy.com.